Slique Kit for weight loss is the ultimate and complete all natural herbal weight loss kit when combined with exercise and healthy diet. It contains the benefits of oolong tea, high protein meal replacement powder and more! It also comes with a free weight management plan and regimen to follow! Everything you need for 30 days in one convenient kit. This is an easy reference guide for Slique Kit for all natural weight loss. It will tell you about the two kits available and will provide you with some fun tips and testimonials! 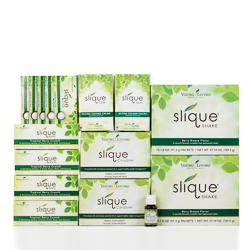 Want to Purchase the Complete Slique Kit for Weight Loss? What is in the Slique Kit? Now, this kit is available as a MEMBERSHIP STARTUP KIT! Join now, and get Slique at wholesale prices right from the start! This premium starter kit is exclusively available for NEW enrollments in the U.S. between December 15, 2017 and April 30, 2018 ONLY! For all the different kits, please review them on OEE Oil Shop. As a reminder these are retail prices but there is also a wholesale membership. Do you want more Information about the Individual oil or supplement? What is Contained in the Supplement or Oil? What are the Documented Uses for the Kit? Antioxidant support; appetite (satiety); cleansing; and healthy weight management support with healthy diet and exercise*. Refer to the links above for specific usage information on each product. For a free weight management plan and regimen to follow for the kit, click here. What are the Safety Precautions? Please refer to the links above for information on each product. If you are pregnant, nursing, taking medication, or have a medical condition, consult a health professional prior to use. And prior to starting any exercise program. Use this kit along with healthy diet and exercise to loss weight naturally and easily!